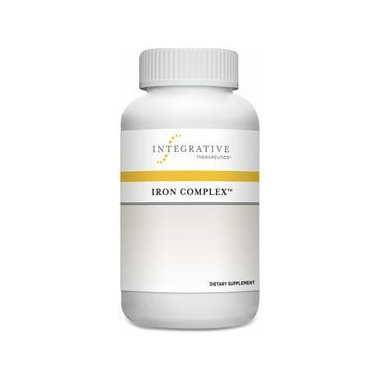 Iron Complex features liquid liver fractions, a rich source of heme iron. Heme iron is the most easily absorbed form of iron, and doesn't cause side effects such as nausea. Iron Complex also includes non-heme iron and other synergistic factors known to increase absorption and promote healthy red blood cell formation. Includes vitamin C for increased iron absorption, transport, and storage. Also contains folic acid and vitamin B12 to help boost energy levels. Adults take 1 softgel daily with food. Take a few hours before or after taking other medications. Liquid Liver Fractions, Folate (Folic Acid), Vitamin B-12, Vitamin C (Ascorbic Acid), Iron (Ferrous Succinate), Soybean oil, gelatin capsule (gelatin, glycerin), yellow beeswax, lecithin, water, chlorophyllin. IRON IN THIS PACKAGE TO SERIOUSLY HARM A CHILD. I have been using this Iron for over 2 years and it works great while not being harsh on my tummy. I take it with Vitamin C so it absorbs better. Great product which i would recommend to anyone. I'm iron deficient, so I have done a lot of research as to the bioavailability of iron supplements, and this form really is great, especially with the vitamin C for better absorption. I recommend.